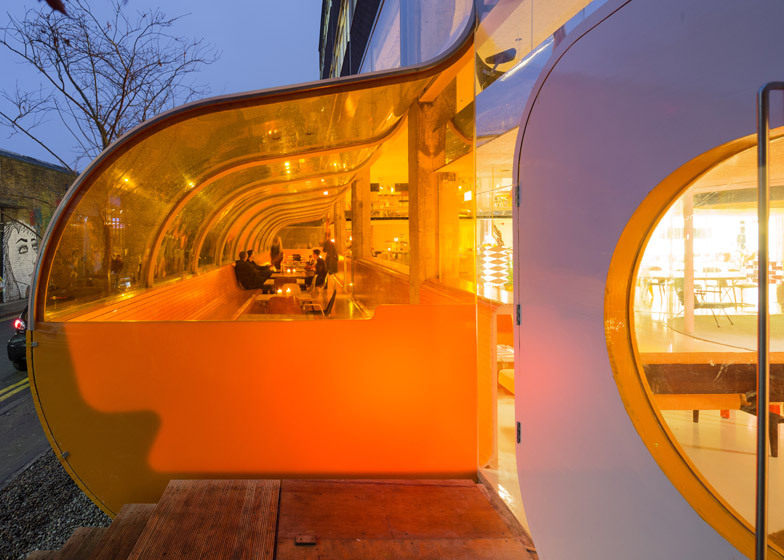 An orange plastic tunnel forms a curvy seating area along the facade of this London office block – the first UK project from José Selgas and Lucía Cano, the architects of next year's Serpentine Gallery Pavilion (+ slideshow). 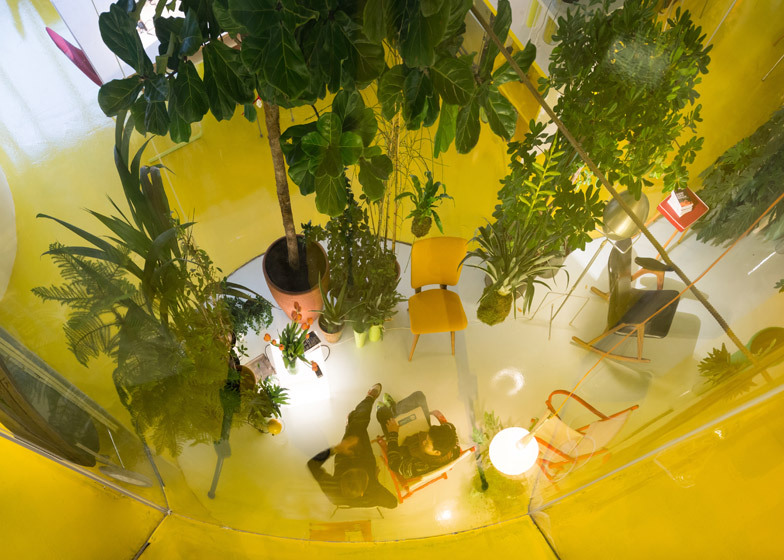 Located in a former carpet factory in Shoreditch, Second Home is a collaborative workspace for various small companies, featuring transparent acrylic walls, over a thousand plants and a so-called "flying table". At the front of the two-storey space is a canteen restaurant where occupants are encouraged to interact with one another and share ideas. 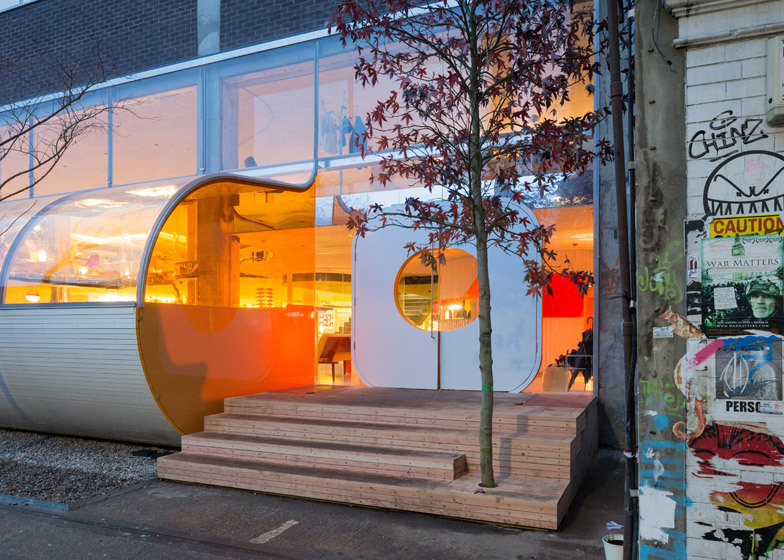 Inspired by Richard Rogers' River Cafe, the area doubles up as an informal workspace. 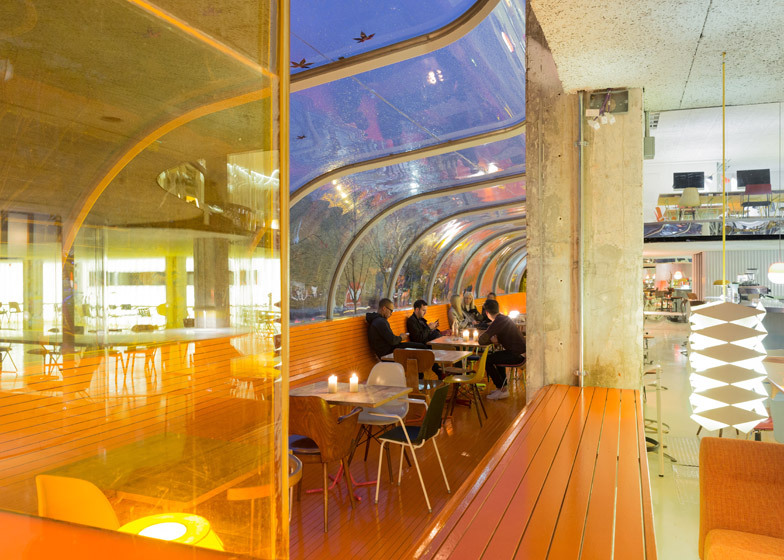 The main seating area is contained within the orange tunnel, described by the architects as a greenhouse. It features a curved bank of seating, painted with glossy orange paint, and a selection of mismatched chairs. Behind this is an events space that can be used for film screenings, music performances and lectures, as well as for company meetings and workshops. To ensure the flexibility in this room, it features a grand U-shaped meeting table that can be winched up towards the ceiling when not in use. Legs can be screwed on and off, to ensure stability when people are leaning on it. 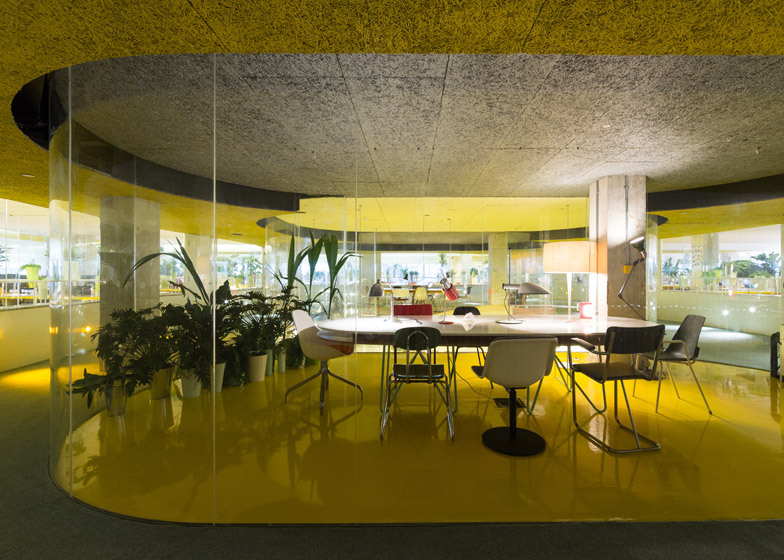 The various offices are spread out over two floors, all contained behind the bubble-like plastic partitions. These maintain views all the way through the building, from the front to the rear. 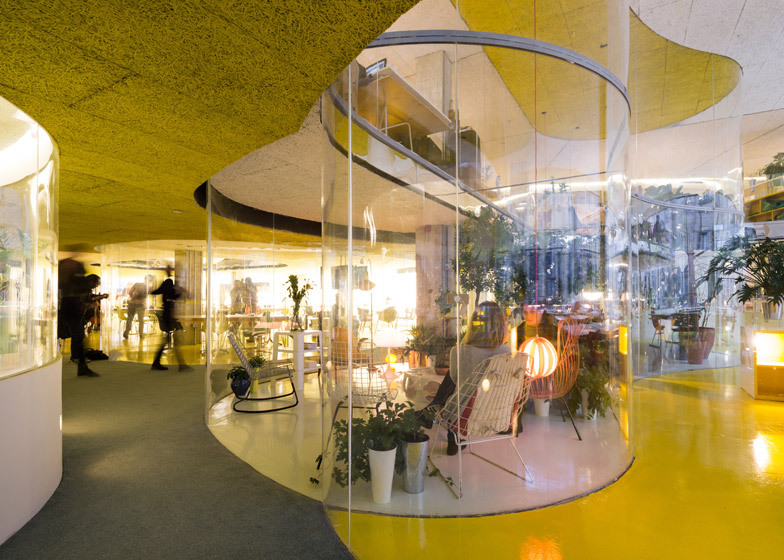 The architects, whose own office is a transparent woodland tunnel, also added extra glazing to the outer walls to reinforce this visual connection. 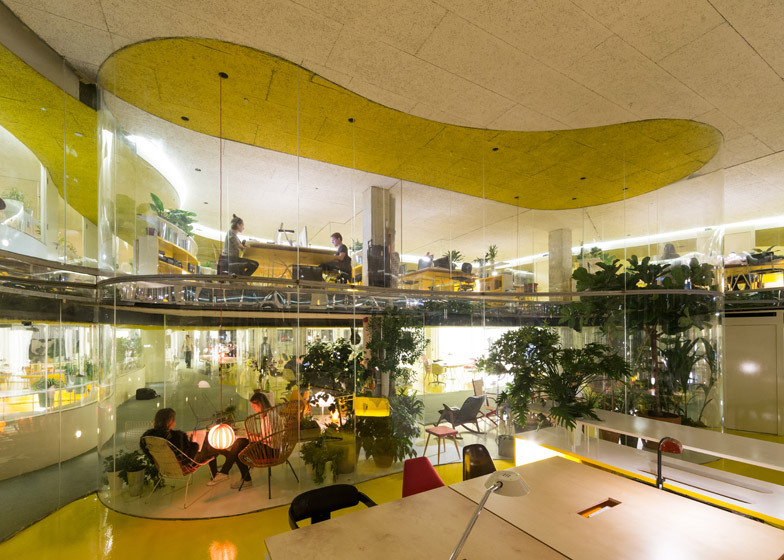 "We realised that we had this great opportunity for transparency in the building," José Selgas told Dezeen during a tour of Second Home earlier today. "Now we've opened up the rear wall, bringing it down to the level of the desks. I think it works perfectly, because now we have this relationship with the neighbours." 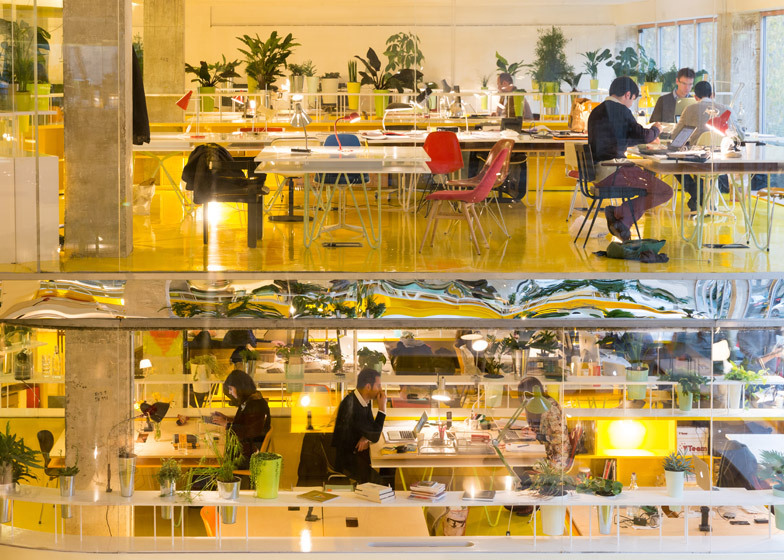 Some of the curvy glass enclosures are small workspaces for four to five people, while others can accommodate as many as 20, including several double-height spaces. Each one is soundproofed, thanks to the insulating properties of the acrylic. "We know about the softness of the material, it's very good for acoustics," said Selgas. "It's not glass, it's plastic so it can move and it absorbs sound. It works perfectly for the sound. You can have people working and you really don't hear anything." "It's also the most transparent material you can have," he added. Mismatched chairs continue throughout the workspaces – in total there are 600 different types of chair in the building, as well as an assortment of different lighting fixtures. Hydroponically cultivated plants line the edges of every office, with many slotting into gaps in the surfaces. A "plant hospital" is located in a courtyard, for nurturing any unhealthy plants. None of the offices have kitchen areas, but staff can enjoy free coffee in the canteen. Corridors feature slightly lower ceilings than rooms. 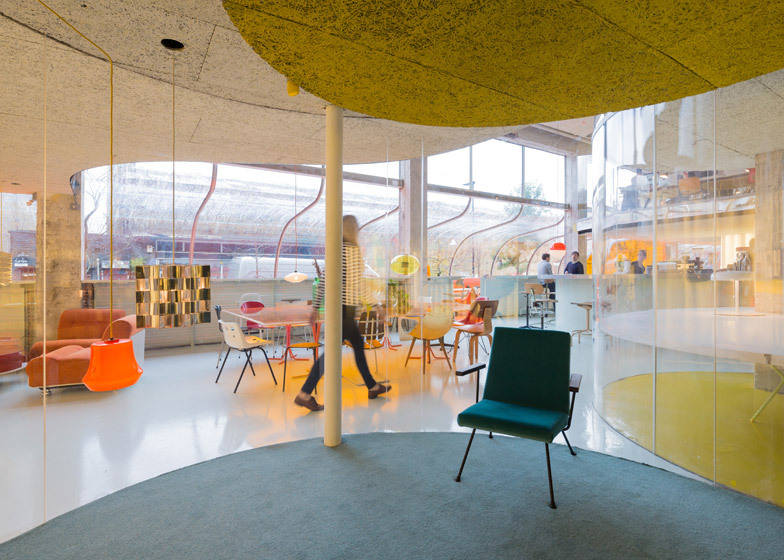 This is because ventilation ducts and other services have been concealed overhead, but also creates a feeling of openness in the workspaces. José Selgas and Lucía Cano were last week revealed as the designers for next year's Serpentine Gallery Pavilion – an opportunity usually only open to architects who haven't built in the UK before. Their design, expected to centre around transparency, will be revealed in the new year.